1. 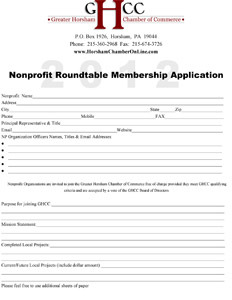 The Nonprofit Organization must complete the GHCC Nonprofit Membership Application in its entirety. 2. The Nonprofit Organization must be recognized per IRS Publication 557. 3. The Nonprofit Organization must have documentation such as IRS form 990. 4. The Nonprofit Organization must be Horsham based and/or directly serves the Horsham community. 5. The Nonprofit Organization must have past, current and future local projects. 6. The Nonprofit Organization must be able to corroborate their local projects. 7. The Nonprofit Organization must be in business for a minimum of three years. 8. The Nonprofit Organization’s representative may be asked to interview before the GHCC Board and/or NPR Committee. The Nonprofit Organization must be voted on and accepted as a member by the GHCC Board of Directors.